Arriving at KidZania is (almost!) as exciting as being at an airport itself! On check in you are given an electronic bracelet (key to your KidZania experience and safety of your children) and 50 Kidzo’s on entry. KidZo’s are like Monopoly money and the core to how KidZania works. Essentially you use your KidZo’s to do the different activities; some ‘pay’ KidZo’s out to do them (like a salary), while other activities ‘charge’ a fee. If you have spare KidZo’s at the end you can spend these at the toy shop at the exit, or you can always save them and use for your next visit. There was a bit of a queue when we arrived but it was a good opportunity to discuss and earmark the activities we wanted to do. It’s a good idea to have a look at (and possibly print out) the map of KidZania before you arrive, so that you can make the most of your 4-hour visit. The electronic bracelet allows you to clock in and out of various activities and once your time is up it can’t be scanned any longer. With no queue it made perfect sense to head here first. My 7-year-old was excited, but my 4-year-old was apprehensive and opted to be a passenger with Mummy and Daddy. 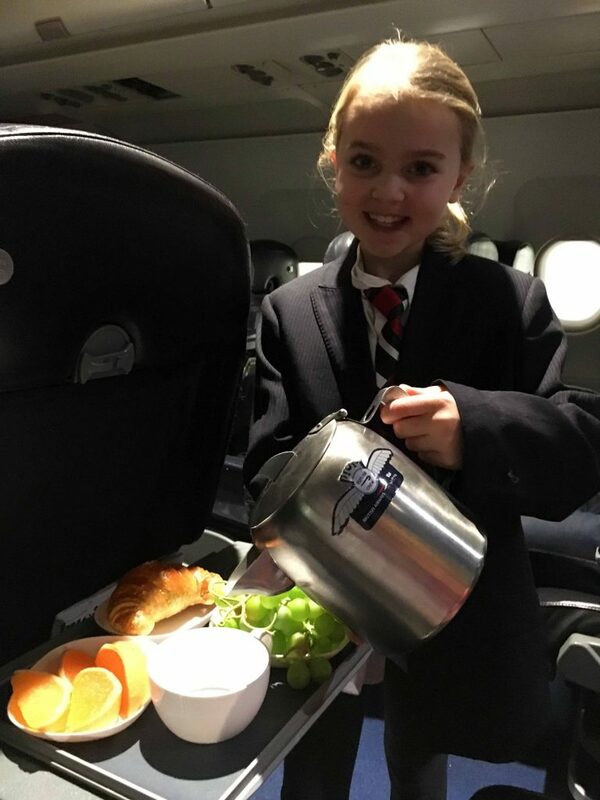 After some brief training we were invited on board, where we were greeted by the young flight attendants who gave us safety instructions and served breakfast on our flight to “Australia”! With a maximum of 12 children for each 20 minutes session it meant we could go straight into this activity. Peering through it was great to see children of all ages and abilities lose their inhibitions, following moves on a screen to popular songs…a lot of improvisation from some of the younger participants but it made being a spectator a lot more amusing! From here was the climbing wall – again another favourite from a previous visit. Bear in mind that if you’re thinking of doing this activity you need to be wearing long trousers, closed-toe shoes and you also need to be over 1m tall. My 4-year-old had warmed up now, after an hour of wide eyes and amazement she decided she would give this one a go as long as her big sister would do it too. 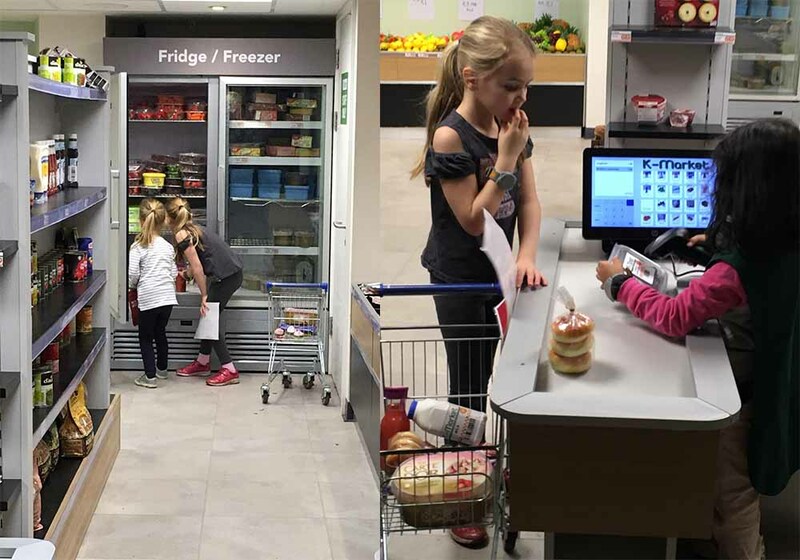 This is a popular activity where kids can choose to be either a customer or behind the checkout, so whilst the girls were queuing for K-Market I went on a little reccy to check out some of the other attractions. This vast mini-city really has got everything you would expect to see in a real city; a Renault engineering centre (taking apart and re-assembling different cars), Courier Service (delivering and collecting parcels across the city), Banking, Hospital A&E (for budding surgeons! ), Animation Studio, Burger Shop, Fruit & Nut Makery (where kids can make their own Eat Natural bar), Fire Station, Hotel, Estate Agents & that’s only a sample of the myriad of activities on offer. 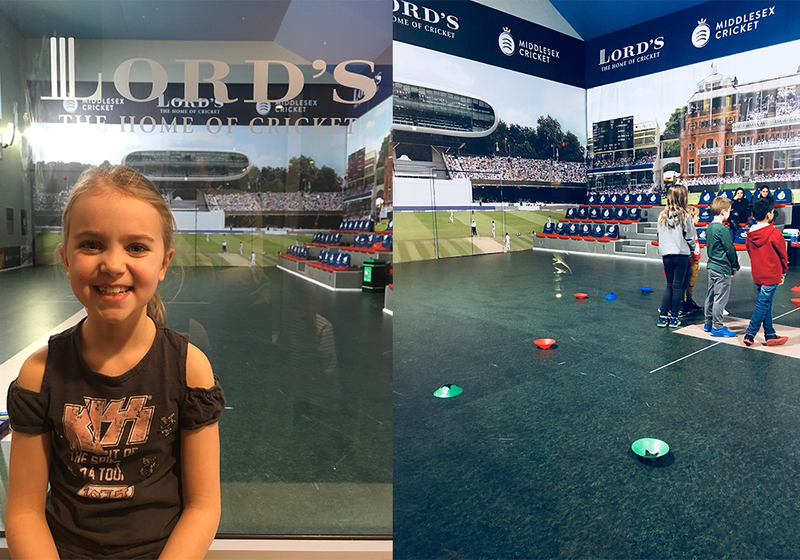 There were also two new activities since our last visit: WWE Superstar, where you can design and create your own superstar using WWE software and bring your designs to life, showing them off in the ring, and also an impressive Middlesex Cricket Club at KidZania’s Stadium (on the ground floor) – I was keen for my daughter to check this one out. It provides youngsters with the opportunity to take part in a new sport, get active and have fun. They start with fitness drills and skills to warm up and participate as a team and then get involved in a mini game, experiencing pitching, bowling and batting, watched on by supportive parent spectators. The activity lasted about 20 minutes and it was great to see the kids burning off some energy! The children were engaged from start to finish helped by the passionate staff running this activity. Finishing off our visit, we headed back upstairs to the Pet wellbeing centre for our final activity. This is where children learn about pet nutrition with Lily’s Kitchen and can perform surgery on a ‘patient’ in the PDSA’s pet hospital. 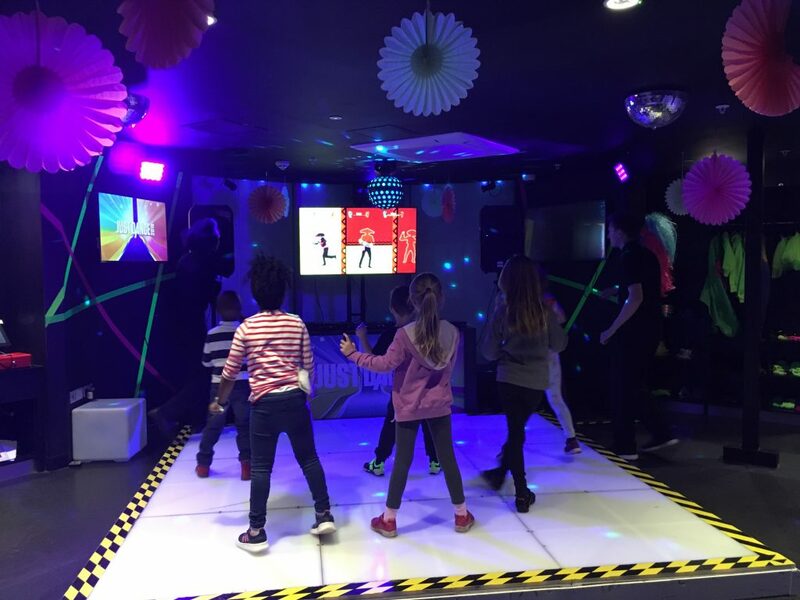 Children can donate KidZo’s to the charity which teaches youngsters about giving back to the community – a nice touch to ensure the experience at KidZania isn’t just about earning and spending. And that was it – our 4 hours were up! My 7-year-old LOVED all the activities and was engaged from start to finish and could have stayed longer. My 4-year-old was a little overwhelmed by the experience and I would say KidZania is better suited for 6-11 years olds, with limited activities for 4-year-olds. However, having said that and since being home, my 4-year-old keeps asking, “When can we go back to KidZania Mummy?” and checking her KidZo’s are still in her purse for our next visit! Omg this sounds fantastic, i enjoyed reading all about your trip.